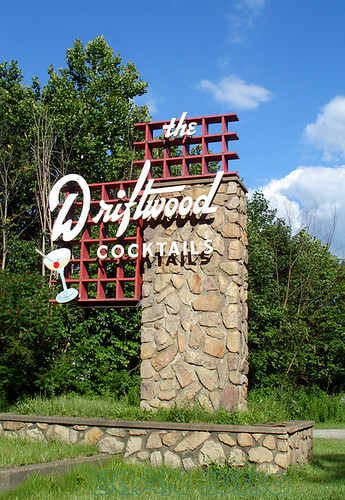 Driftwood Cocktails sign, Lincoln Highway/US 30, E of Ligonier, PA, a photo by brianbutko on Flickr. Not much to look at on the outside. The inside is spotless and RETRO 1965ish. Nice jukebox with oldies. The chicken they sell on Sundays across the street is TO DIE FOR good. Don't be afraid of long lines. It's part of the experience and worth the wait.